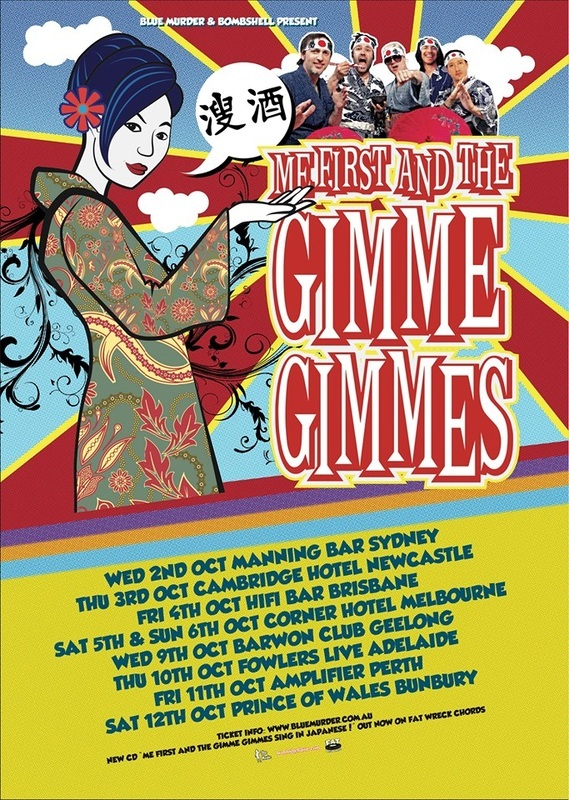 Me First and The Gimme Gimmes are returning to Australian soil to play eight capital city and regional shows this October! Since their last visit in 2010, the all-star-punk-rock-supergroup-cover-band released their Sing in Japanese EP, which does exactly what it says on the box. If you don't speak Japanese, that's cool, it's also their first tour since the official release of Go Down Under. They've been in your hearts since the nineties, now is your chance to get them back into your hometown. It's not like you don't know the words. NOFX guitarist Eric Melvin, Fat Mike's replacement on this tour and DJ extraordinaire, has recently been spotted behind the decks in California, Hawaii, Japan and Italy bringing fire with his truly original Punk Rock>Hip Hop>Disco "MOSH UPS". This is a chance for Brisbane, Melbourne and Adelaide to hear and see the MELVINATOR do his thing live at these Me First and the Gimme Gimmes after parties! Sat 5th Oct - Melbourne, BANG!